The Government of Guyana may only end up paying the Caribbean Premier League (CPL) principals close to US$1.5M for the hosting of several games during this year’s tournament. Natural Resources Minister Raphael Trotman, on Wednesday confirmed that the Government has seized the opportunity to host six of the games for the tournament in light that it will be a good injection for Guyana’s economy. 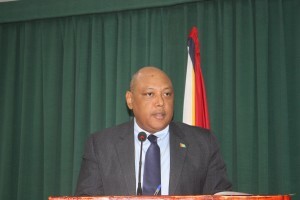 More so, Trotman stated pointed out that the final matches will be played during the very year that Guyana celebrates her 50th Anniversary of Independence. “The CPL organizers extended the offer of hosting the finals, semifinals and four games here,” said Trotman at a post cabinet press briefing. He noted that it would be an excellent addition to the range of activities that the Government has already planned to commemorate Guyana’s jubilee anniversary. “We believe having cricket here, the stars in Guyana, the festive mood, will be a good injection to our economy,” said the Government Minister. Relative to the costs that Government may pay to host the games, it is understood that the CPL Organizers initially requested some US$4M. However, Trotman told reporters that they requested some US$2M. While negotiations are still ongoing, government is expected to strike a deal with the franchise for US$1.5M. “The initial request was in excess of US2M but the last figure I heard was 1.5M,” he noted.